Product code: ES8151 Categories: Antique, Antique Engagement Rings, Art Deco, Art Deco Rings & Art Deco Engagement Rings. Here is an absolutely charming double cluster diamond ring dating from the 1920’s that is just gorgeous and destined to always be admired. Beautifully hand made in 18 carat yellow gold and platinum, this ring has not one but two clusters of diamonds. The way the band itself splits and seems to wrap a loving arm around the clusters adds to the charm and romance of this truly delightful ring. Each cluster is set with six rose cut diamonds surrounding a central rose cut diamond and from the end of one across to the other cluster, this distance measures 13.1mm. This is without a doubt one of the most charming and sweetest Art Deco diamond rings around and one that will always put a smile on your face when you look down and see it on your finger. 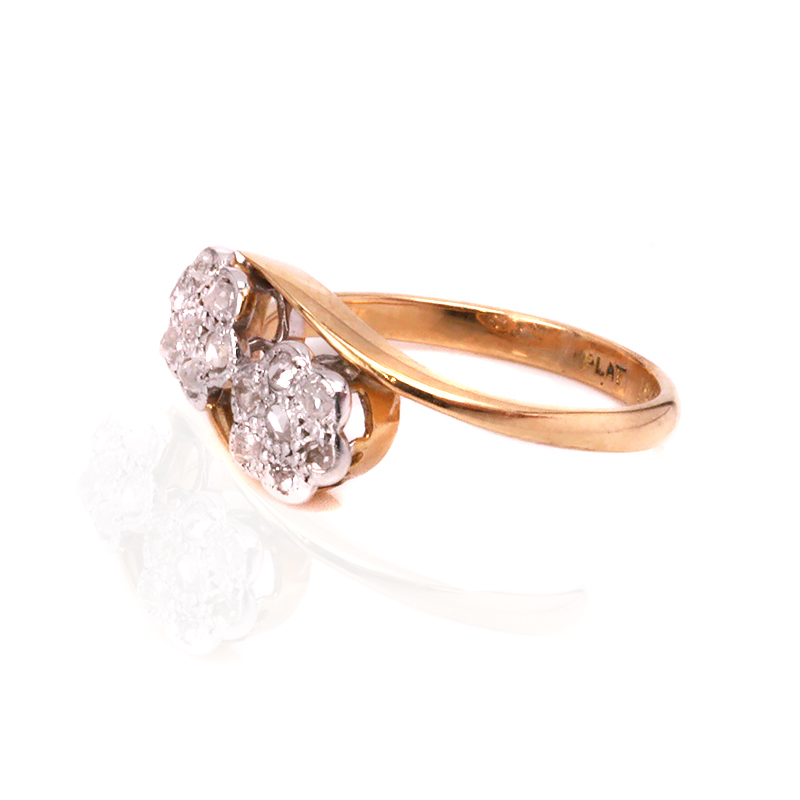 This Art Deco diamond ring was hand made in 18 carat gold and platinum. Set with genuine antique rose cut diamonds, it is designed with not one but two clusters.